Arduino Blog » Arduino Create comes to Chrome OS devices! An Arduino-powered iris door… for chickens! 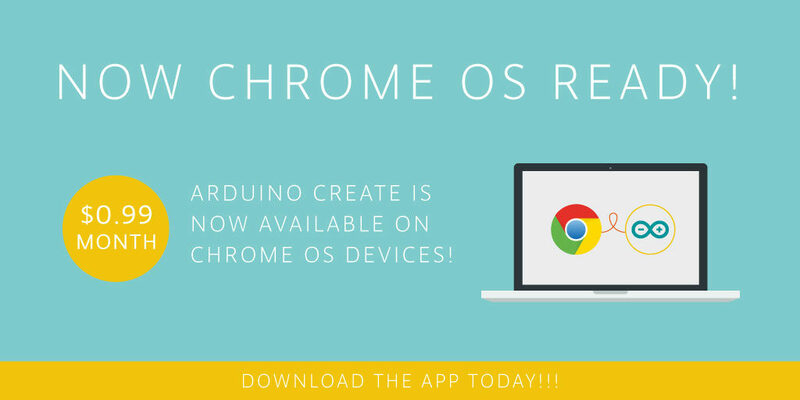 Arduino Create comes to Chrome OS devices! Arduino Create is now available to everyone on Chrome OS devices, with $0.99 per month subscription. An Arduino account and Google ID is all you need to use it, just follow the Create Getting Started guide on your Chrome OS device. We are actively working on specific licensing and pricing for schools, so stay tuned. The new Arduino Create Chrome App enables students and other users to write code, access tutorials, configure boards, and share projects. Designed to provide a continuous workflow from inspiration to implementation, Makers can easily manage every aspect of their project right from a single dashboard. Developed with the classroom in mind: The Arduino Chrome App allows you to teach and tinker with Arduino electronics and programming in a collaborative, always-up-to-date environment. Built for Chrome OS: Code online, save your sketches in the cloud, and upload them to any Arduino connected to your Chrome OS device, without having to install anything locally. All the contributed libraries are automatically included. The following Arduinos are currently supported: Uno, 101, Mega, Esplora, Nano (ATmega328), Micro, Zero, MKR1000, MKR Zero, MKR Fox 1200, Pro and Pro Mini (ATmega328). We are actively working with the Chromium team to restore support for the Arduino Leonardo in a future Chrome OS release. As usual if you encounter any bugs, issues, or have an idea on how we can improve the Chrome app, please open a discussion thread on this Forum page. Please note that this app will work only on Chrome OS, if you click on the Google Store link on any other OS you will not be able to install it. UPDATE: We are applying for the Google for Education Partners – Technology Track to learn how to offer bulk discounts to schools and classrooms. Other Google Education apps that are part of this program can be found here. Has there been any progress/update regarding school accounts? School is back in session for us and I’m trying to figure out how to use Arduino Create with my students. I can’t commit them to create accounts and pay a monthly fee. Great news! Sort of. Any word on education accounts? I’m in the same boat as @pwelte. We are dying to use our SIKs with our kids, but all we have for them to use are Chromebooks. No dice without free access for students. Even a bulk discount or site license could work. I’m chiming in like lentst. School’s going, lots of students hoping to use the Chromebooks. Any progress on the site license education? Dear Android wizards. Thanks a lot for making it possible to programme Arduino’s from chromebooks. At our school we were wondering if there is some progress regarding site license, school discounts or even just a more convenient way to pay for this chrome extension at school. We would be willing to pay as long as it is in a manageable way. @eye4tech @ajahr @lentst @pwelte we are working really hard to provide you with the Arduino Chrome App for schools, updates really soon! There will be bulk discounts and instructions to install the app to multiple devices at once, as you do with the other apps of the GSuite. Thank you so much for your patience! Any update on the Arduino for schools program? How do we get the students up and running through the program? Thanks for your work! A whole school year later and no update? Will it be available for next school year? We’re pretty much a chromebooks only school and I’m looking at what tech options are available for chromebooks. Thanks. I too am here to inquire about the state of this plugin. I would also like to state for the record that Arduino has long been a supporter of Open Source software, and charging schools for software that is free for other platforms hurts. In the very least, could you let us know where we stand? How difficult can it be to enable an educational discount or option? I have a great idea. Since it is so difficult, why not just open source the entire project, and share it with everyone. You can make up the difference by additional hardware sales to all of the educational institutions that are ChromeOS only.